RTÉ SAYS THAT it has not introduced ‘secret bonuses’ to staff, after a report this morning said that such bonuses were given to more than 200 managers last year. The report in the Irish Independent said that the paper had details on 207 managers receiving “performance increment increases” while RTÉ was amassing a deficit of over €19.7m. 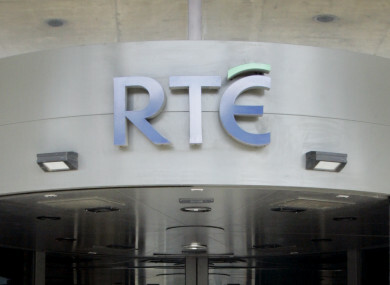 The report also contained details of a Freedom of Information request from Labour Senator Kevin Humphreys, which showed that around 40 RTÉ managers received increases of an average of 3.25%. RTÉ has 167 staff who are “managerial”, said the Irish Independent, a figure which rises to 289 when professionals and specialist staff are factored in. In response to the story in this morning’s Irish Independent, RTÉ said it “can clarify that it has not introduced ‘secret bonuses’ to RTÉ staff”. As we have stated clearly many times previously, RTÉ introduced a series of cuts to staff pay as part of significant reform across the organisation from 2008 – 2013 which saw a reduction in operating costs of €130 million. Pay restoration – reintroduced in 2015 – is based on binding agreements negotiated by the RTÉ Trade Union Group on behalf of RTÉ staff and followed this period of cuts to staff pay. Uniquely RTÉ was the only public body to voluntarily suspend and stop increments, stopping manager increments for some 4 years. As agreed with the RTÉ Trade Union Group and as communicated to RTÉ staff in 2015, pay restoration is being introduced on a phased basis: 15% was restored on 21 December 2015; a further 42.5% was restored on 19 December 2016; additional tranches of 21.25% each were restored on June 30 2017 and on December 18 2017. Yesterday, RTÉ said it will bring forward the publication of fees paid to its top 10 most highly-paid presenters. It also confirmed yesterday that a review of role and gender equality across the organisation will take place. He said that what is needed now “right across the whole spectrum is clarity in relation to what salaries are being paid within RTÉ, especially to the management”. He said that the “vast majority of employees in RTÉ are paid about €50,000 but we’re talking about top management through a period of austerity that did receive these payments, and I think there is a need for transparency and clarity in this”. RTÉ’s Director General Dee Forbes was not available to comment. There was much criticism levelled at RTÉ over the weekend, after the Sunday Independent highlighted the fact that RTÉ news presenter Sharon Ní Bheoláin earns €60,000 – €80,000 less than her co-anchor Bryan Dobson. This followed in the wake of it emerging that there is a gender pay gap at the BBC in terms of how much it pays some of its best-known staff members. Email “RTÉ says it has not introduced 'secret bonuses' to staff”. Feedback on “RTÉ says it has not introduced 'secret bonuses' to staff”.